Bias: Behaviour and/or beliefs based upon experiential modeling (non-statistical). Biases are necessary behavioural shortcuts because individuals cannot evaluate every single thing involved in every particular event and biases allow a person to act in accordance with the superficial information generally available. However, biases are not always rational and can be strongly contrary to societal norms. Terrorism: An act or acts meant to cause fear of harm in others in order to affect behaviour. Terrorism is one of those things in life that is so important that its definition has been clearly set out - both in society and in the law. We may argue over whether a particular set of facts fits within the definition, but reasonable minds do not disagree with its definition. The federal definition of terrorism is spelled out in 18 USC 2331 as activities which (1) involve illegal acts (2) that are dangerous to human life (3) with the apparent intent to (a) (i) intimidate, or (ii) coerce the population, or (b) influence government policy thru (i) intimidation or (ii) coercion, or (c) affect governmental behaviour thru (i) mass destruction, or (ii) assassination, or (iii) kidnapping. In Virginia 18.2-46.4 defines terrorism as (1) (a) 1st degree murder, or (b) 2d degree murder, or (c) voluntary manslaughter, or (d) violent crimes done by a mob, or (e) abduction, or (f) felony malicious bodily wounding, or (g) malicious bodily injury, or (h) robbery, or (h) carjacking, or (i) felony sexual assault, or (j) arson of a residence, or (k) destruction of a public building while occupied, or (l) being (i) a conspirator, or (ii) an abbettor, or (iii) an accessory before the fact to any of the previously listed crimes (2) which are committed with the intent to (a) intimidate the civilian population at large; or (b) influence the conduct or activities of the government of the United States, a state or locality through intimidation. Even if you only rely on dictionaries you get similar definitions. Oxford Dictionary Online defines it as "the use of violence in the pursuit of political aims", Cambridge Dictionary Online says it is "violent action for political purposes" and Merriam-Webster states it is "the systematic use of terror especially as a means of coercion." Right. 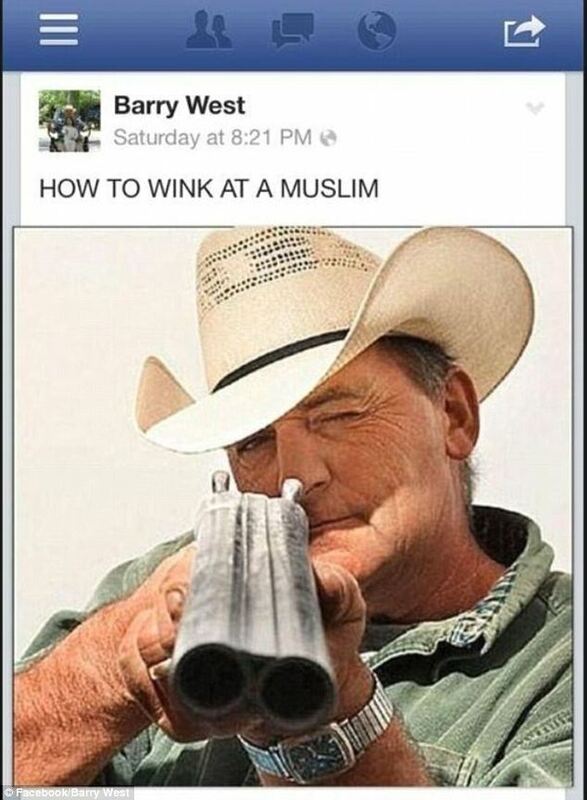 So this was apparently a one-off, thoughtless joke Barry West forwarded from someone else and only meant to share with his "friends" on Facebook. The man obviously never thought it would go any farther. However, in the modern era of constant need for "news", this non-story was salacious enough and fit into the Americans in flyover country are ignorant meme of sites like HuffPo, ThinkProgress, and msnNow and therefore it got lots of over-coverage (and I'm sure local media followed their lead). Pretty quickly, they beat the guy into submission. 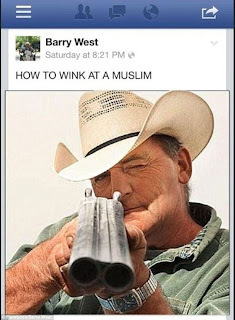 A hate-filled religious terrorist would be someone who believes he has a positive duty under his religion to go out and do X to others to make them act in a certain manner. This man is reacting to a perceived threat. He may be over-reacting, but there's nothing here to indicate that his reaction is religion based or that he feels that he has a positive duty to seek out and harm or cause fear in those not of his religion in order to force them to behave in a certain manner. I have to disagree. A terrorist is not trying to make others act in a certain way. A terrorist is trying to induce terror by threatening violence and/or carrying out violence. Try as I might, I can't come up with a single act which falls into a "just to create terror" category. Most actors engaging in violence or threats have a blending of reasons for their violence. Revenge, self-aggrandizement, and intimidating other potential victims seem to be the top three reasons. Attacks such as the Oklahoma City bombing - which was undeniably terroristic - are usually a mixture of revenge (for Waco and Ruby Ridge), attempted inspiration (trying to inspire like minded people the rise against the federal government), self aggrandizement (we remember McVeigh and Nichols), and an attempt to affect the behaviour of others thru terror (to cow the government so that it would not use militaristic force against people). It also seems an unsupported assumption to state that these biases rise out of a religion (presumptively Christian) rather than fear and anger brought about by a long list of terroristic attacks on American targets by people associating themselves with Islam - the bombing of the Embassy in Lebanon, the first World Trade Center bombing, the Khobar Towers bombing, the killing of U.S. airmen in Germany, the USS Cole attack, 9/11, the Benghazi attacks, and the Boston Marathon - as well as a long list of similar attacks in Britain, Russia, the Sudan, Egypt, Thailand, the Philippines, India, Pakistan, and Indonesia. To be fair, while not terrorism itself, the bias expressed in the joke is such that it may be indicative of a society that fosters terroristic activity. On the other hand, the glib reposting of a Facebook joke is not a good way to measure the depth of a bias. It required almost no time, thought, or effort (a couple clicks) and seems more likely an indication of a bias that is widely shared but shallow. How many thousands of people, through the simplicity of Facebook, shared this particular jape? Unknown. Probably thousands. Looking through my Facebook feed this morning there are all sorts of similar posts relying on shallow biases. Jokes rely on biases in order to give the person receiving the joke a frame of reference. My feed has jokes based upon biases about men, women, children, parents, and Yankees. I do not expect any of those are indications of strong bias but they are indicative of widespread bias or they would not be so popularly reposted. Actually, the question that keeps popping into my head is, what is the agenda of the person who initially publicized this story? Because, that person put a lot more effort into this than the politician who clicked twice to repost. Last Friday was the second part leg of this year's three part CLE teaching schedule. The first was a two hour presentation that I do every year for the 30th Circuit's Bench-Bar CLE in March (when you're in far Southwest Virginia it's not practical to go where most Virginia CLE's are held, so we do our own). For that one I provide the local Bar with a written summary of all of Virginia's published appellate court crimlaw decisions (as well as pertinent 4th Circuit and US Supreme Court cases). Then I do a two hour presentation of the cases which are the most interesting or that most affect crimlaw practice. Usually, this is broken down into Constitutional Law, Criminal Procedure, Evidence, Substantive Law, Probation, Appeals, and Habeas sections (dropped Habeas this year & may also drop Appeals next - just feel like the time could be better spent on the other topics). Preparation is time intensive, but it's a fun lecture to give. It's particularly good that I know almost all the people in the room and don't have to worry about any appellate court judges being in the audience so things can be a little more candid then you typically see in a bigger CLE. There's always at least one case that makes it into the presentation as the most illogical decision of the year, just so that I can gently poke fun at it while the attorneys in the audience groan and roll their eyes. Although, I must admit that this year the fun case wasn't an illogical case. Instead, it was the Great Motorcycle Helmet Slapdown in which the Virginia Court of Appeals issued the most defendant friendly opinion I've ever seen out of that court (I won't say the only one, no matter how tempting it is) and struck down a whole pack of convictions for having unapproved motorcycle helmets. Last Friday's CLE was the Solo & Small Firm Regional Bench-Bar Conference for the 28th, 29th, & 30th Circuits. I presented a quick half hour on Virginia case law with some new legislation thrown in. Then an AUSA did some of the same for federal matters and then Judges Dotson & Moore as well as Dean McGough from the Appalachian School of Law made some comments and the audience posed questions to the panel. Of course, this time I only knew about 10% of the people in the room and I'm pretty dang sure there were appellate court judges in there. So, my comments were a little more restrained, although I must admit that I was sorely tempted to say something snarky about the case in which in which the Court of appeals rejected an appeal because the defense attorney objected that a juror would be biased and the appellate court said the proper objection should have been that the juror would appear to be biased. Next comes the CLE in which I travel to each of the local counties and tell the attorneys what new criminal laws passed by the General Assembly of Virginia. I comb through the new laws and put together a summary of those which will affect criminal law and procedure. Then I present it (usually over lunch). This started out as something I was doing for our county's deputies and police officers. It's always interesting to hear the questions the officers have as compared to the questions the lawyers have. The officers tend to ask questions like, "How the heck are we supposed to do that?" and I have to admit that more than once I've had to look them square in the face and shrug my shoulders. Of course, there is usually a new statute or two which leaves you shaking your head. So far, the one I've had the most fun with was the nobody can drink your beer outside your house statute. The lawyers thought it was funny, but the officers got to the meat of the matter immediately: "So, what you're telling me is that every backyard cookout has to to be BYOB? You hear that Bob? You don't get to mooch beer off me anymore. It's a law."